Yap, yap, yap! A very vocal Sassy announces that company is coming aboard. Anyone who has ever met Sassy knows that she is a yapper. You come in, she yaps. You go out and come back in right away, she yaps. You go downstairs to use the head and come back, she yaps. Sassy is a 15-year-old schnauzer/terrier mix and belongs to my friend Joe. Sassy has been a faithful crewmember aboard his 57-foot Nordhavn Daddy’s Money since the day she was adopted as a rescue puppy in Rockport, Texas many years ago. While her yapping would irritate most people, Joe is not one of them. When someone complains, Joe tells the story of how years ago Daddy’s Money was docked at a marina in Bradenton, Florida. At 2 a.m. Sassy woke him yapping. 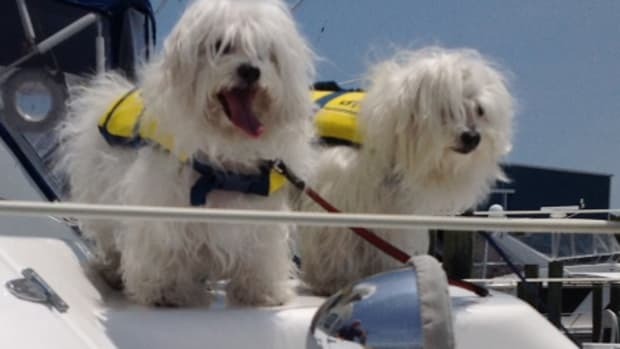 When he got up to see what she was barking at, he discovered thieves were boarding his boat. Sassy’s barking not only woke her owner, she scared off the thieves. So, Joe is tolerant of the noise, as she has proven its worth. Over the years, Joe and Sassy ritualized their morning and evening walking schedule so she could “do her business.” Sassy understands the rules of boating and has learned that on occasional overnight passages, she needs to use the AstroTurf on deck, since taking her nightly walk on the grass is not possible. About a year ago, 5-year-old Lulu (a rescued one-eyed, bum hip rat terrier) joined Sassy as part of the Daddy’s Money crew. Lulu belongs to my friend Dawna, who is Joe’s significant other. Sassy, taking Lulu under her wing as a protégé, taught Lulu everything she knows about being a good boat dog (everything, that is, except for how to keep from being seasick on long passages), and, yes, Lulu now yaps too! Recently, Sassy began having health issues and the vet put her on diuretics. Not thinking much about it, Joe gave her the medicine and trekked to the boat expecting things to be as usual. To his dismay, their typical routine was continuously challenged as Sassy demanded to go outside every few hours, and, when Joe and Dawna were not there to take her, used the expensive indoor rug as a substitute for the marina grass. They tried everything—taking her out as often as they could and putting the grass mat inside the boat in an inconspicuous corner. They even imposed on friends to take her out if they could not make it back to the boat in a timely manner. All this effort was for naught, as Sassy simply could not “hold it” and began to pee everywhere. So, being a practical boater, Joe sat down and engineered something he hoped would be a good solution to the problem—a doggie door. This would allow Sassy to not only go out to do her “business” whenever she wanted, it would also allow both dogs to run on the deck of the boat while the owners were away. The doggie door was designed to fit into the seldom-used portside door located in the dry helm station. 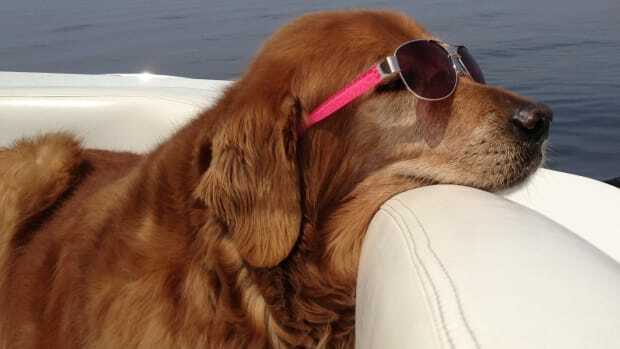 To avoid putting a hole in the boat, like you would in the door of your house, local canvas guru Judy (www.boatdecorllc.com) devised a snap-on barrier which would allow the boat door to be ajar 8 inches, giving the dogs access to the deck while keeping the air conditioning in. At the bottom of this 12-inch-wide canvas barrier she sewed in the PetSmart doggie door. Judy recommended a fabric called Stamoid instead of Sunbrella because Stamoid is waterproof, more lightweight, and rolls and folds better than Sunbrella. When Judy was done, Joe and Dawna discovered that the track the open door usually fits in when closed, was a problem for the small dogs. Because of the gap, they would not jump over it for fear of falling into it. So, Joe and Judy created a foam wedge that fit into the track and the problem was resolved. At first Sassy was leery of the door, and did not know what to do with it. Then Lulu saved the day. She immediately grasped the concept, went effortlessly through several times and Sassy followed suit. The protégé had become the teacher—yet another boating issue was solved. Joe figured out how to solve a sticky situation and is now the proud owner of a doggie door leading to the perfect “poop deck”—and all for a mere $250 investment. Smart and simple; Isn’t that just like a boater!